Today I woke up telling myself, “Hey – it’s Friday! Don’t screw up like you did last week and eat meat like an idiot!” So I went on a quest to find something satisfying that wouldn’t drain my wallet. First I went to a local restaurant/bar, Banana Boat. After Ashley handed me Bud Light, I perused the menu but couldn’t find anything that I could order and get served fast enough to get somewhere to watch the Florida/Missouri game in the SEC Championship. 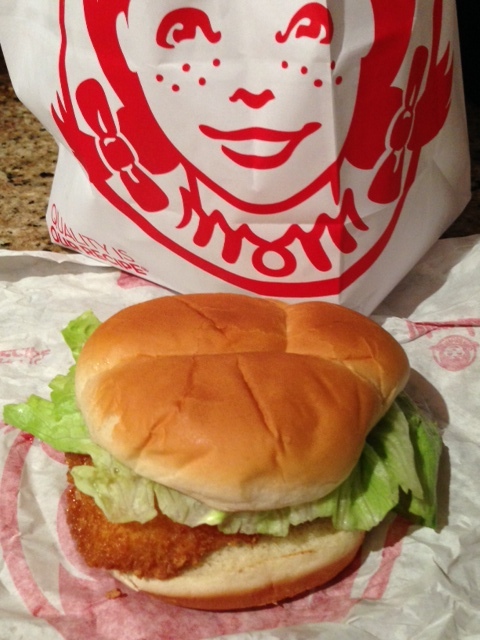 So I decided to go up the road to the local Wendy’s and try their Premium Cod Fillet Sandwich. “Premium”? I guess so – larger and more filling than their competitor’s fillet. But a bit pricey – I think it’s twice the price of the Irish-sounding counterpart, McDonald’s Filet-O-Fish. Wait – is that really “Irish-sounding”? Maybe I think so because it’s almost St. Patrick’s Day – anything with a “Mc-” and an “O-” must be Irish.